When Christians from the communities inspired by the 16th Century Reformation (traditionally called Protestants) debate the subject of the Virgin Mary with Catholics they usually say something like "Well, of course we honour Mary but these things Catholics do just aren't Scriptural." Which always makes me think two things. Firstly, in all the flood of books and blogs, sermons and songs produced by these Christians Mary is hardly ever mentioned. It is a curious way of honouring someone to ignore them assiduously. Protestants only ever seem to talk about Mary when arguing with Catholics so what do they mean by saying "of course we honour Mary?" Secondly, granted that some Catholic Marian (Marian means about Mary) beliefs are only implicit in Scripture even if you ignore those the explicit New Testament allusions to her clearly demonstrate that of all the merely human creatures in the Bible no one is more highly deserving of praise and honour than the Blessed Virgin. Don't believe me? Let me walk you through the verses. The angel went to her and said, ‘Greetings, you who are highly favoured! The Lord is with you.’ Luke 1:28 NIV At this point the only things that we know about Mary are that she is a virgin and that she is engaged to be married. The Archangel Gabriel describes her as "highly favoured" the Greek word in the text, kecharitomene, can be variously translated. The Vulgate renders it as "gratia plena" that is 'full of grace'. The Geneva Bible, a good Protestant translation, has Hail thou that art freely beloved. So we have this young woman who is highly favoured by God or filled with grace by God or freely beloved by God. Note that these things are said of her before she becomes the mother of Jesus or even consents to do so. That is, Mary is already an extraordinary woman in some way. Why else would Gabriel apply this word to her? He adds "the Lord is with you" This same phrase is found in 2 Chronicles 15:2 The Lord is with you when you are with him. So why is Mary freely beloved and why is the Lord with her? The evidence from Scripture would be that she must be a devout and virtuous woman to a phenomenal degree. Her virtue and devotion are so great that God responds to her love in a phenomenal fashion also. The angel said to her, ‘Do not be afraid, Mary, you have found favour with God. Luke 1:30 NIV Gabriel here tells Mary that she has found favour. It might perhaps have been argued that Mary was a passive recipient of God's bounty. Many Protestants seem to argue that any Jewish virgin would have been up to the task that Gabriel is about to unfold. Here, however an active not a passive term is used. Mary has done something which has caused God to look with favour upon her. No heroic act of our Lady is recorded prior to this so the plain, literal sense of Scripture would lead us to suppose that it is the entire way that Mary has lived her life up to this point that has caused God to look so positively upon her. You will conceive and give birth to a son Luke 1:31 NIV Sometimes we become so familiar with an idea that we take it for granted and stop noticing how mind-blowingly amazing it actually is. Mary is a virgin. As a virgin she is going to have a child. And not just any old child the unique Son of God. This young woman whom we now know to be virtuous, devout and loved by God to an extraordinary degree is going to become the mother of One who will be the Saviour of the world. There is a story (or myth) that the painter Picasso was requested to sketch a woman's portrait. He quickly did so and then offered it to the woman for $6000. "But it only took you 5 minutes" she said. "Only 5 minutes and also my entire life" said Picasso. The salvation worked for us by Jesus in a sense only took the few hours between His betrayal by Judas and His death on Calvary. In another sense it took His entire life. And for about 30 years Mary was to be the central figure in that life. ‘How will this be,’ Mary asked the angel, ‘since I am a virgin?’ Luke 1:34 NIV This is not the first time in Biblical history that an Angel has promised a child to a woman. In the Old Testament there are the examples of Sarah, mother of Isaac, and Hannah, mother of the prophet Samuel. In the Gospel there is St Elizabeth, mother of St John the Baptist. This, however, is the first time that a woman who is a virgin receives such a promise so again we see something unparalleled elsewhere in the Bible concerning Mary. It is also worth wondering why Mary would ask this question since St Luke has already introduced her to us as betrothed to St Joseph. Unless she was pledged to a life of virginity then she would expect conception to follow the normal course of her imminent married life. And if she was pledged to virginity then this too was a new thing in Israel for there is no record in the Old Testament of young women making this offering of themselves to God. The angel answered, ‘The Holy Spirit will come on you, and the power of the Most High will overshadow you. So the holy one to be born will be called the Son of God Luke 1:35 NIV This crucially reveals the relationship that the Blessed Virgin has with the Holy Trinity. We already know that she is highly favoured by God the Father, now we learn that God the Holy Spirit is to become fruitful by her, she becomes in a sense the spouse of the Spirit, and that God the Son is also to become Son of Mary. In all human history, in all salvation history, no one, not Abraham, not Moses, not David, not Solomon not any of the prophets enjoys such an intimate and special relationship with each person of the Trinity. Search the Scriptures and you will see that it is so. And Mary said, Behold the handmaid of the Lord; be it unto me according to thy word Luke 1:38 KJV We do not know how old Mary was at this time but it is reasonable to infer that she was a young woman, probably in her teens. In any event having been told the most awesome, incredible, mind boggling thing in the world see what her response is. She might have been forgiven for asking more questions, or expressing some doubts or point blank refusing. Our Lady did none of these things. Her faith is as perfect as a human's could be, her response is prompt and whole hearted, cheerful even. At the very least she is a role model for all Christians. A faith which does not have Mary as the poster child for faith and joyful acceptance of the gifts of the Spirit is surely missing a trick and, arguably, not reading their Bibles very attentively. At that time Mary got ready and hurried to a town in the hill country of Judea Luke 1:39 NIV Hearing that her elderly cousin St Elizabeth was pregnant Mary did not take time to digest her own remarkable situation. She went with haste across some rough country to support her cousin. Having displayed perfect faith Mary now displays perfect, self-forgetful, love. 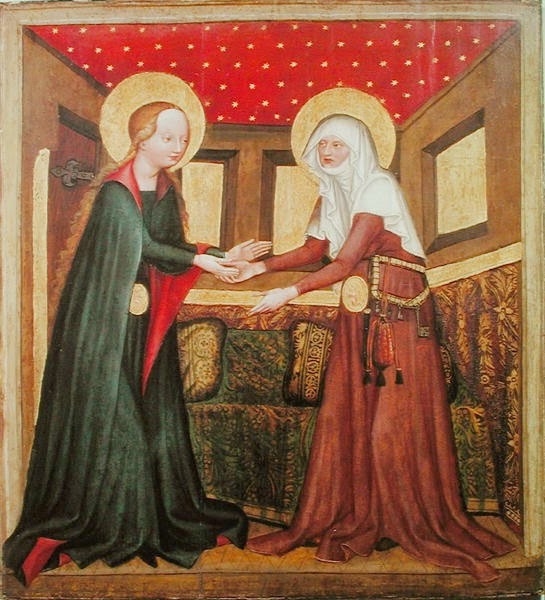 When Elizabeth heard Mary’s greeting, the baby leaped in her womb, and Elizabeth was filled with the Holy Spirit. Luke 1:41 NIV It is important to note the sequence of events. Mary on arrival immediately calls out a greeting. 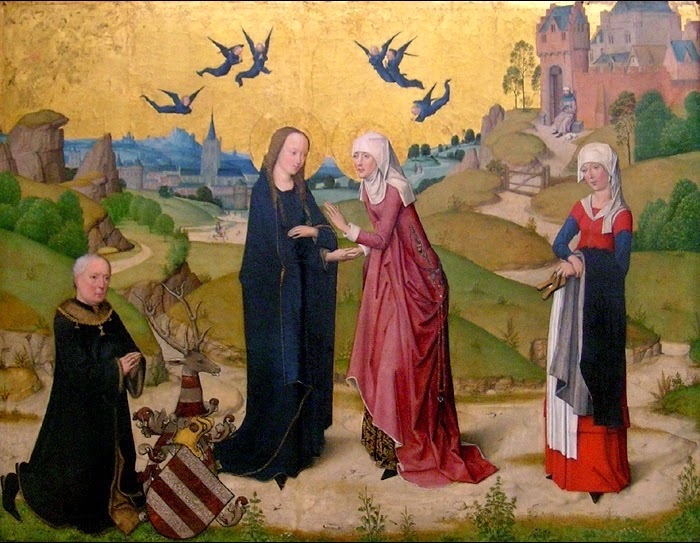 On hearing the sound of Mary's voice, and as a result of hearing Mary's voice, St John the Baptist leaps in the womb and St Elizabeth is filled with the Holy Spirit. I am being fairly insistent on this point because I have heard Protestants argue that it was the presence of the unborn Jesus that prompted these things. The clear and unequivocal words of Scripture do not say any such thing. It is the sound of Mary's voice that has these effects. That this is so because Mary is the Theotokos, the God Bearer, is certainly true but it does not lessen the glory of God to accept the clear sense of Scripture here that Mary was the chosen vehicle through which His Spirit flowed. In a loud voice she exclaimed: ‘Blessed are you among women, and blessed is the child you will bear! Luke 1:42 NIV Now, rememeber that St Elizabeth is filled with the Holy Spirit while she utters these words. What she is saying is what God wants her to say. And what she says is that Mary and her unborn child share the title of Blessed. Note also she does not say "blessed because of the child you will bear." The Virgin is certainly blessed for that reason but recall that she was also blessed because she had found favour with God, because the Lord was with her even before the Annunciation of the Archangel Gabriel. But why am I so favoured, that the mother of my Lord should come to me? Luke 1:43 NIV Again notice that, still filled with the Holy Spirit, St Elizabeth explicitly states that to be visited by Mary is a favour which she has received. Clearly Jesus and Mary are inseparable at this stage in the life of our Saviour so you cannot have the one without the other. What St Elizabeth is experiencing is that Jesus, as it were, shines through Mary. Or, to put it the other way round, Mary is transparent to Jesus. Even if this was only the case during the nine months of her pregnancy, and there is no reason in Scripture to assume that her openness to her Son was of such short duration, it still follows of necessity that Mary has a special closeness to God and a special gift of sharing that closeness that no other person, male or female, in the Bible could claim to have. Blessed is she who has believed that the Lord would fulfil his promises to her!’ Luke 1:45 NIV Here the inspired St Elizabeth reveals another reason to consider Mary blessed. She believed fully and firmly in the promises of God conveyed to her by Gabriel. Which is to say that before she conceived Jesus in the flesh she had conceived Him in her heart. Belief preceded conception it did not follow it. We can say additionally that our Lady is blessed because at that moment she became the first Christian, she believed in Jesus before there was a Jesus to believe in. Her contemporaries believed in the Messiah who was to come, she in the Messiah who had already come and who dwelt, in the flesh within her own body and in the Spirit within her own heart. And Mary said:‘My soul glorifies the Lord and my spirit rejoices in God my Saviour Luke 1:46-47 NIV So, in her first response to all this praise heaped upon her the Blessed Virgin immediately praises the source of all her blessings and joy. She is in this a model of humility, an example of one to whom praise and thanksgiving arises spontaneously to her lips. I have seen Protestants argue from this frank acknowledgement by Mary that God is her Saviour that she must have been a sinner since otherwise she would not need salvation. I do not think that this follows. We believe, do we not, that children who die in the womb through abortion or miscarriage might go to heaven. If they do then this is because the merits of Jesus are imputed to them, since this is necessary for salvation, but we do not assume that unborn children are guilty of actual sin. The only way to heaven is through the blood of Christ and the Catholic Church is happy, along with Mary herself, to acknowledge that her salvation like ours was wrought by her Son Jesus. From now on all generations will call me blessed, for the Mighty One has done great things for me Luke 1:48-49 NIV Our Lady prophetically foretells that until the end of time all generations will call her blessed. Those who do not do so are clearly resisting the Spirit and paying little heed to the plain sense of Scripture. She also tells us why all generations will do this, because the Mighty One has done great things for her. That is, we cannot think of the blessedness of Mary without thinking of the Divine One who blessed her. Those Reformation Christians who fear that giving praise to Mary means robbing praise from God have turned a both/and gift from God's bounty in an either/or choice which smacks of over scrupulousness on their part. Catholics do not fear to praise those to whom praise is due because we know that this praise is only due and can only be due because they have been richly gifted by God who is the source of all good in heaven and on earth. Follow @stevhep on Twitter, Google+ and Tumblr Follow Catholic Scot on Pinterest. You thought evil against me: but God turned it into good, that he might exalt me, as at present you see, and might save many people. Fear not: I will feed you and your children. And he comforted them, and spoke gently and mildly. You might be forgiven for thinking that these are the words of the post-resurrection Jesus. In fact it is the Joseph who is mostly famous now for his amazing technicolour dreamcoat who is speaking. His words come at the end of a remarkably moving episode (Genesis 50:12-21) in the final chapter of Genesis. If this blog does nothing more than persuade you to read the passage then it will be a good job well done. The context is that following the death of their father the brothers of Joseph feared that he would now exact revenge for them having sold him into slavery many years before. He, of course, did nothing of the kind. I think that this is significant to us for two main reasons. It shows a continuity between Old Testament (OT) and New Testament (NT) values and in Joseph we see a type or figure of Jesus so that the more we reflect upon him the more we will know about our Saviour. There is a school of thought which suggests that there is such a marked contrast between the God of the OT and the one of the NT that really they are two different Gods or conceptions of God. Historically this has given rise to various heresies beginning, I think, with the Marcionites. Today the idea manifests itself chiefly in the suggestion that Christians are or should be embarrassed about the OT. A related idea suggests that Jesus is so radically different from historical Judaism that He must have learned His ideas of religion from India, specifically from Buddhism. The actions of Joseph, which are eminently compatible with Christianity, point up the fallacy of these approaches. 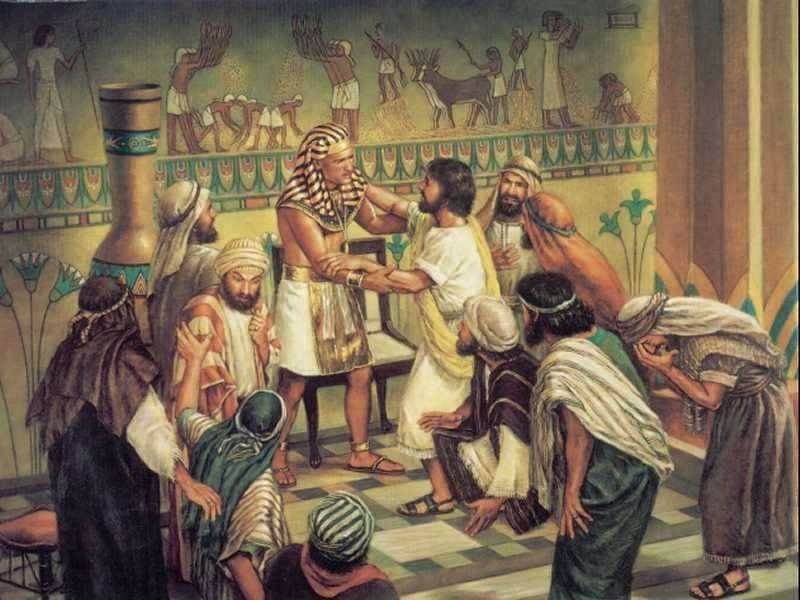 As the Chief Minister to the enormously powerful Pharaoh Joseph would have had a free hand to do whatever he wanted to his brothers who were, after all, perceived as uncouth barbarians by the cultured Egyptians. The brothers had betrayed him and his subsequent life had been for many years both hard and bitter. Had he extracted and eye for an eye and a tooth for a tooth no one would have blamed him. And yet he did not. Not only did he offer forgiveness but went beyond that to offer material well being and gentle love to his betrayers and their families. He did this explicitly in the name of his God and the authors of Genesis who virtually end the book with this episode clearly present it as a logical expression of faith in the God of Abraham. A casual reading of the OT shows a deity who could be described at best as grumpy though perhaps the fine old Scottish word carnaptious might be more apt. The people of the OT, however, did not read it casually. Actually in most instances they did not read it at all, they heard it. And the text which was delivered verbally came with a context, everything would be accompanied by a commentary if by commentary we understand not merely words to describe meaning but a way of life and set of values through which and by which to understand meaning. There would be tensions and disputes over meaning within the community of course, which human community is free from those?, but the thread of understanding which see's God in terms of mercy, forgiveness, long-suffering and gentleness is never entirely absent from the narrative. If He is seen at times as Angry God it is an anger which has more of sorrow than of ire within it. Joseph is an example not only of how humans, specifically in this context Jews, should behave it is also an illustration of how God Himself behaves, forsaking justice for the sake of mercy. If it is sometimes difficult for us, with our different contexts, to see this merciful OT God in quite the same light we seldom have much difficulty in seeing Jesus in that way. Hence the usefulness in considering Joseph as a prefiguring of Jesus. They were both associated with a group of 12, Joseph and his brothers, Jesus and His Apostles. They were both betrayed and sold to the enemy. They both endured a Passion, Joseph being imprisoned. The psalmist describes this episode in a remarkable way too : the iron pierced his soul, Until his word came. The word of the Lord inflamed him. (Psalm 104/5:18-19) And they both forgave those who had abandoned them. It is also perhaps worth mentioning that until old Jacob, also called Israel, died the brothers has no fear for their safety. The respect that Joseph had for his father would have in any case restrained his hand from exacting justice whenever Israel pleaded for mercy. Mary, a daughter of Israel and the mother of Jesus, stands in the same position in relation to her Son. It may well be that without her advocacy on our behalf we will encounter mercy instead of the just punishment our conduct deserves. But whether or no that is so if we take her for our advocate all doubt is removed, we will certainly encounter mercy from Jesus if Mary pleads our cause.
" For my own part, I will gladly spend and be spent on your souls’ behalf, though you should love me too little for loving you too well. " As I understand it the Catholic argument from Natural Law goes something like this. Each person has, as a given, a conscience, which is where the basic guide to right conduct and right living dwells within their mind and heart. Additionally each person is endowed with reason which enables them to approve the urgings of their consciences as being compatible with rational analysis of situations. Therefore when a person acts in accord with both conscience and reason then they will be living lives which are good, virtuous and productive of moderate levels of happiness. All of this can exist apart from divine revelation, which means that it is theoretically possible to live lives more or less pleasing to God without ever having heard about Jesus or His gospel. The Catholic Church does not hold to the notion that it is a necessary condition of the moral life to be a Christian. As you might expect this argument is neither atheistic, the intervention of God is required at all points, nor without caveats. The conscience is only a given because God gives it, humans only possess reason because God has endowed them with it. To be willing to listen to one's conscience and then to have the strength to act upon it both require an active gift of the grace of God. Moreover, the wounding effects of Original Sin mean that we are easily tempted to ignore our conscience and pervert our reason in order to pursue a greedy, selfish or lustful agenda all of our own. Conscience Alone and Reason Alone or the two together apart from divine revelation are unreliable guides because they depend upon ourselves understanding them aright and we are unreliable judges in our own cases. What revelation, especially that contained in the person of Jesus Christ, Son of God and Son of Mary, gives us is a reliable guide. A standard arrived at through the honest and sincere exercise of conscience and reason is a "good enough" standard. The standard derived from revelation exceeds that infinitely, it is a "good measure, pressed down and shaken up and running over" (Luke 6:38) and it is unfailingly reliable since based not upon ourselves but upon the perfect one. The Apostle Paul expresses his willingness to spend himself in the service of the Corinthians without expecting much of anything in return. Many might see in this an admirable thing but would note that there is nothing particularly Christian about it. Mothers spend themselves recklessly on behalf of their children if the need arises. Revolutionaries risk everything in the service of a cause whose success they do not expect to see. Nurses and doctors will volunteer to put themselves at risk to being healing and comfort to those in dangerous situations or with highly contagious diseases. Is there anything uniquely Christian about this? Well, only this, Paul is making himself vulnerable and spending himself on behalf of the souls not the bodies, emotions or feelings of the Corinthians. He is motivated by the desire to help the Christians of Corinth enter into a deep personal relationship with the unseen God in an as yet unexperienced eternity. The Church identifies three particular characteristics which it calls theological virtues, faith, hope and love, and the Apostle displays all three of them here. He is willing to spend himself for the Corinthians regardless of their feeling for him because he loves them. 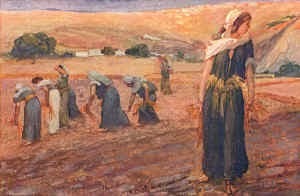 He has hope that, by the grace of God, he will succeed, in bringing himself and others into the kingdom of heaven, he has faith that the means which will bring this about, which he is spending himself in bringing to Corinth, are fully contained in the revelation of God through Jesus Christ. 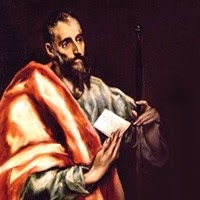 In short, St Paul is staking everything upon his conviction that Christianity is true and he is doing so exclusively to benefit other people. Again it could be argued that other causes provoke similar types of conduct in other people. Which brings us to the characteristic part of the Apostle's fundamental motivation which is contained in the word 'gladly.' Some may sacrifice themselves grimly or determinedly. Some may do so gladly in the sense of 'freely and without hesitation.' 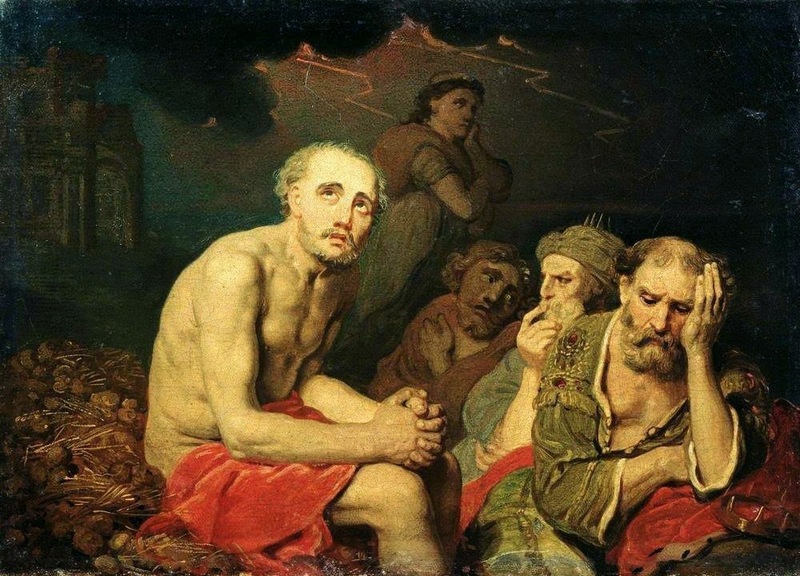 When St Paul use the word he means 'with gladness' 'joyfully.' The sacrifice is not one whereby he gives up his happiness that others may be happy. It is a fundamental condition of his happiness that he act in this fashion and failing to so act is what will make him grim and gloomy. The more fully we resemble Christ then the more fully we enter in His joy. And since the summit and purpose of His mission was to be broken and abandoned on the Cross of Calvary in order to spend and be spent for the sake of sinners then when we do the same we are clothed with Him and He inhabits our hearts, illumining them with the light of eternal love. This is clearly a way of being glad which we can only recognise and desire as a result of revelation and grace. And it is too a higher, better and objectively superior way to anything that conscience and reason apart from revelation can offer. No human creature ever entered more fully into the life of Christ and so expressed the theological virtues at their furthest limit than Mary, the Mother of God. Standing at the foot of His Cross her total love for Him caused her to feel every agony that He felt such that there were two sinless people crucified on Golgotha that day. But, as if that were not enough, there was more, her love for Jesus extended to those for whom He was dying, ie all of us, so that in love and for love she offered up her sufferings on that dreadful mountain to God as a superabundant sacrifice to be added to the treasuries of God's grace. Even in those dreadful moments of Passion and death for her Son she never lost her faith that the revelation to her from God through Gabriel would come true and that Jesus would yet reign on the throne of David nor her hope that she would be by His side in heaven and on earth. In this Mary is our great role model and if we feel, as we should feel, that we are far from successfully imitating her she is also our most sweet advocate who will entreat her Son on our behalf to send us the graces we require to be conformed to Him through being like her. When I go into my house, I shall repose myself with her: for her conversation hath no bitterness, nor her company any tediousness, but joy and gladness. And they understood not the word that he spoke unto them. And he went down with them, and came to Nazareth, and was subject to them. And his mother kept all these words in her heart. This is part five of a series on Christian Meditation. In the first four parts I looked at the verse from the Book of Wisdom as a guide to meditation provided to us by its author (by convention King Solomon.) Here I propose to show that in Mary, the Mother of Jesus, we can see all the different elements of meditation summed up and displayed to us in perfection. In Mary we encounter one who is at once an object of contemplation, an icon or role model of one who contemplates and a powerful helper to those who call upon her assistance in meditating. In Part Two I touched upon the apparently puzzling phenomenon of a very, very male dominated religion such as Temple Judaism personifying Wisdom as female in the way that the author(s) of the Book of Wisdom and the Book of Proverbs did. There are no doubt cogent historical, philosophical and linguistic reasons for this choice. Without denying the truth or importance of these reasons the Church has always delighted in seeing in the words applied to Wisdom, as a quality of or companion to God, a type or figure of the Blessed Virgin. The perspective of the Church on this proceeds from the insight that Mary is the one human creature who through her completely unique relationship to the Blessed Trinity, chosen one of the Father, spouse of the Spirit, mother of the Son, is so united to God that in contemplating her we contemplate Him as in a spotless mirror. (Creature is a technical term in this context, it means one created by the Creator so in that sense cannot be applied to Jesus.) Therefore the qualities listed as belonging to Wisdom essentially belong also to Mary by Grace and in the fullest measure possible to a creature. Likewise where Solomon considers meditation to be a conversation with Wisdom the Church understands that this could equally apply to either an encounter with pure divinity or with the Mother of God as a channel of His qualities. Strictly speaking the only proper object of contemplation is God. Only He is infinite Love and infinitely loving. Only He can raise up our hearts and minds into the unity which transcends all else and fulfils entirely our purpose for being. If we contemplate Mary in meditation we do so only and precisely because she draws us ever more closely into that unity with God in which she herself is immersed. It is impossible to consider her in contemplation without also considering the source from which she derives all her qualities. The question then naturally arises 'why consider her at all? why not go straight to the source?' It is certainly true that one can meditate on the Godhead directly or upon the Son of God as incarnated in Jesus. Indeed, if one has been granted the Grace to meditate in this fashion then that is precisely what one should do. However, many of us struggle to relate to an abstract concept such as the Trinity, others cannot forget that Jesus is Judge as well as Saviour and struggle with the implications of this in contemplating Him. God, who desires that all should be saved and none be lost has provided many aids and helps to His people. He does not despise our frailties and fears, He loves us for them and offers us ways to surmount them. And this is one reason why He offers Mary to us. For, if our Lady is a mirror of perfection she is also one of us. She is 'our tainted nature's solitary boast' (Wordsworth) In her we see a creature, a woman, a mother, a sister, a companion, a teacher, one who was puzzled, one who was anguished, one who prayed, one who lived a working life mostly marked by poverty, a refugee, one bereaved of a Son, a faithful, humble, gentle soul. She is, in short, eminently approachable. Her purity does not inspire us with fear, as that of her Son's might do, but with a desire to emulate her. More than that those qualities such as love and simplicity which we can consider in abstract terms as belonging to the essence of God are exemplified as practical concrete things in the life and words of the Virgin Mother of Jesus. It might be that some of us can bypass our Lady in contemplation or that others can, as it were, leave her behind beyond a certain point as one enters deeper into God Himself yet nonetheless for many of us she is an indispensable ladder who offers herself because she is offered by God to those who need her. In Hindu thought there is a way known as Bhakti Yoga. This basically proposes that the best and easiest path to knowledge of God is through a loving devotional relationship with the divinity considered in a particular aspect as, say, friend to friend or lover to beloved. For Christians Mary above all others is our Bhakti Yoga, she is our Mother, fellow pilgrim, exemplar, advocate, sharer of our sorrows. The Blessed Virgin also serves us as the perfect icon of a creature who meditates in order to know God better and love Him more. The words of St Luke at the top of the page tells us that Mary did not understand the word Jesus spoke and she kept it in her heart. The temptation for us here is to say 'she did not understand but she treasured it anyway.' There is no but however. She did not keep the words of Jesus because she understood them nor because she failed to understand them. She kept them because they were the words of Jesus, she needed no other reason. One of the pitfalls that beset us in meditation is the constant attempt of the mind to think discursively or analytically about a topic as if constant mental effort will eventually lead us to conquer infinity. Meditation is not about analysis and Christian meditation is not an affair of the mind it is a relationship from the heart. We give our attention to the object of contemplation, whether that be an episode from the Passion or an aspect of the personality of our Saviour or whatever, and we hold our attention fixed upon the object. Whatever distracts us from the object is not contemplation. Our aim is not so much to understand that which we contemplate as it is to be transformed by and into the One whom we contemplate. This, by the way, is not a general rule for life. The discursive mind and the analytical tools which it can deploy are excellent things in their way. We could and should use it and them in all sorts of ways to understand the universe and the world around us. Nor can it be said that any aspect of the Christian religion should be off limits for the use of these tools and the results that flow from them can be broadcast from the rooftops. Christianity has nothing to fear from the use of reason and the results of investigation. Contemplation, however, is a different category of endeavour and requires a different skill set from scientific exploration. In this sphere what we took as an object of investigation ten minutes ago and will take up again as an object of investigation twenty minutes from now is currently being looked at from a different angle. We put penetrating its secrets into abeyance while we allow it to penetrate our hearts and pierce us with its infinite love. And this is precisely what the Evangelist shows us Mary doing when she kept all these words in her heart. Our Lady can help us in meditating in two main ways. Firstly, by the role she played in the life of her Son. That is, we can contemplate episodes in her life and episodes in the life of Jesus viewed from her perspective. The Holy Rosary is above all others the most favoured method of meditation used by Catholics and the one through which we can contemplate most systematically the saving mission of Jesus through the eyes of Mary's heart. Apart from this we can take the episodes from the Gospels and the Acts of the Apostles in which she appears and/or the words she is quoted as using and hold them attentively in our minds. For example her beautifully simple advice Whatsoever he shall say to you, do ye. (John 2:5) or this about the Apostles gathered around our Lady awaiting Pentecost All these were persevering with one mind in prayer with the women, and Mary the mother of Jesus (Acts 1:15) In contemplating what she did and what she saw we find ourselves always being led by her into an ever closer, ever more trusting and ever more loving relationship with the three Persons of the Trinity and above all with her Son Jesus Christ. Mary also helps us in this aspect of our lives, and indeed in every other aspect of our Christian lives too, in her role as Advocate and Mediatrix of All Graces. That is to say through her hands flows the Grace that proceeds from God towards all those who are in exile here in this world at this time. Whether we turn to Mary as an object of contemplation or not the Christian would be wise to begin meditating by calling upon her to look kindly towards us sending us the Grace we need to contemplate well. We would also do well to to ask her to plead on our behalf to the just judge, Jesus her Son, that He receive our adoration, offered from our heart to His during the time of meditation, as we should be offering it and not as we do actually offer it, disfigured by our sins, distracted by our earthly concerns. With the help of Mary we will do well, without it we will do nothing worth talking about. 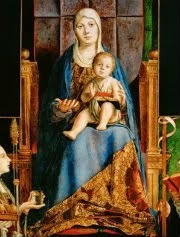 And we would be no less wise at the end of our period of contemplation to thank our Lady for the help she has given us. It always pleases Jesus when we show love for His mother and it always pleases Mary to lead us to Jesus. Catholic Christians at least should also always be pleased to offer thanks to the Blessed Virgin for this one thing above all- we thank Mary for being Mary. The light of thy countenance O Lord, is signed upon us: thou hast given gladness in my heart. Joy is one of the fruits of the Holy Spirit and should be an experience of any Christian who lives by faith whether they meditate or not. Moreover, since faith is a permanent condition, joy should never be absent from the heart of a Christian. That being so then this joy must be something which can co-exist with suffering and depression since many Christians experience these, indeed suffering is unavoidable in life. So, how can one be joyful and anguished at the same time? As with most things in Christianity the key to the puzzle is love. Faith is not simply a 'head thing,' the intellectual assent to the propositions of the Nicene Creed, it is a relationship of love between a believer and her God. A life of faith, then, is a life of love. When a child breaks his leg her mother suffers agony and pain right along with him because she loves him. The love causes the pain but also exists as a permanent unbreakable foundation to their relationship. Joy has come into her life at a deep level with her child and does not depart so long as the child lives and has not rejected her whatever traumas and disasters occur along the way. So it is with faith, love and joy. Whatever occurs along the way in a Christian's journey so long as they have faith then they have a confidence that underlying everything else that happens the love of God is present to them and they are present to Him. This confidence is joy. It can also be characterised as gladness since along with faith and love there is always hope. Whatever situation a Christian finds themselves in or see's their loved ones facing they have a sure and certain hope that either in time or in eternity God will display His infinite kindness, gentleness and mercy. For the Christian there is no tunnel which does not have a light at the end of it. It is important to emphasise that though this joy and gladness are always present so long as one has faith we are not always aware of it consciously. If we have twenty levels there may be times when it is absent, or appears to be, from nineteen of them. It is no sin to be depressed or to be stressed or afraid. In the Garden of Gethsemane Jesus went through all these emotions and with good reason. Likewise Mary at the foot of the Cross stands as a model showing us one in whom there was both an agony beyond words to describe combined with a serene faith that the promises of God would be fulfilled in and through her Son. The ladder that links us to heaven may sometimes have frayed to be the merest of threads but so long as it, that is to say we, do not break then we are linked to heaven at all times and all places and so at some level we will be in a condition of joy and gladness. So much for the life of faith, what of meditation? Much Christian writing on this subject contrasts the abject state of the benighted sinner with the ecstatic experiences of union with God which meditation leads us towards. It depicts what we are fleeing from and what or whom we are travelling towards. My aim is a more modest one. Peak experiences are by their very nature rare events, a normal period of meditation does not include being raised up to the third heaven or having a vision of angels. Moreover, if our aim is ecstasy then we could easily be tempted to practice meditation in order to enjoy spiritual experiences rather than doing so for no other reason than to express our love for and to God through Jesus Christ. I wish here to talk about the hodden grey of daily meditation year in and year out not the gorgeous technicolour butterfly wings of the days when we are able to fly freely in the light of God's Sun. Most times a period of meditation is like a kiss from a spouse before we go to work, a telephone call from a child who lives a hundred miles away, a Christmas card from our best friend. The conversation we have with Wisdom is seldom about the complex problems of life or the great mysteries of heaven. It is the feather light touch of a presence which at once reminds us of our shared past, holds a promise for the shared future and gives us in the moment in which we are, the only point of time about which we can be certain, a contact with that which we above all other things adore being in contact with be it never so brief or never so faint. Joy and gladness flows inevitably from such a conversation. It is present with us as we converse, and we carry it with us for the rest of the day not merely as a memory of joy but as actual joy itself. In Part Three I talked about the Dark Night of the Soul where Wisdom chooses to make her presence within our heart-house take the form of apparent absence. Is it possible to say that joy and gladness flow from this conversation where the only words heard are "My God, My God, why have you forsaken me?" Well, the object of meditation is neither to experience the hodden grey nor the technicolour flight of the alone to the Alone. The object is to make ourselves present to God and say 'behold the handmaid of the Lord, be it done to me according to your word' and then wait. So long as we are not waiting for 'experiences' or 'ecstasies' but simply for Him and simply because we love Him then however dreary the desert, however arid the months and the years of waiting may be then every moment spent sitting and waiting is a moment where we spend ourselves for love alone. I have some experience of those who sit by the bedside of a dying loved one. It is a great torment to them to do this, and it is a service for which they receive no earthly reward. Yet they would not give it up for worlds and it is a service the gladly and freely give. If the only way to express your love is to hold the hand of the one you love while they die then that is what you will do. In times to come it will be a joyful and glad memory to you that you have known this person and done this thing. In the Dark Night you hold the hand of one who is as if dead but is, in truth, alive and wild horses could not prevent you from doing this, because you love Him so much. In Part Five I hope to look at Mary and Christian Meditation. I also have had empty months, and have numbered to myself wearisome nights. If I lie down to sleep, I shall say: When shall arise? and again I shall look for the evening, and shall be filled with sorrows even till darkness. In Part One and Part Two we looked at going into our heart-house, reposing with Wisdom and entering into conversation with her. Here we look at the two things specifically excluded from the conversation, bitterness and tediousness. Why is it important to look at what is absent? Well, in a sense, these two things are unknown to Wisdom since she has no experience of them herself. They are, however, known to and by us. Since it is a conversation and not a monologue we must leave these things behind if we would converse with her. That is, meditation is a process which changes us. Wisdom does not come to resemble us we come to resemble her. Therefore the roots of bitterness and tediousness within ourselves must be removed or at least rendered harmless if we would grow close to this most welcome of guests in our heart. In the UK at least it has always struck me as a complete waste of time for street evangelists to shout out invitations to passers by to repent of their sins. Mostly because these passers by for the most part only have a vague idea of what it is they are being invited to repent of. We need to understand what this thing is before we can escape from its grasp. Christianity holds that the purpose of our individual existence is to love. Love is not a solitary pursuit, it needs to have an object. Nor is it an abstract notion, it requires to be expressed. We are called upon to love God with all our strength and to love our neighbour as ourself, these are our objects. Love as an active force in the world takes the form of service and self sacrifice, that is its expression. Sin consists of a radical refusal to feel that love or to express it. It is a form of selfishness that sees self-gratification as the primary motivation for any action. As an aside I should say that atheism is not necessarily a sin as such. If one seeks for God honestly and sincerely but cannot discern Him that is not a refusal of love it is a search for it. If, however, atheism comes from a refusal to search born out of a fear of what might be found then it is a sin. It is a curious thing that the more one dedicates one's life to self-gratification the more bitter and alienated one is likely to become. This is because we are designed better than that and we are acting contrary to our design specifications whenever we sin. Those things which we gratify are our bodies or our emotional whims. They are only parts of ourselves. Yet to be happy we must satisfy the whole of ourselves, mind and body, spirit and soul, and only a life lived in conformity to our true nature can achieve this. It is also important to remember that why we do what we do is as important as what we do. It is common enough for people who live lives of service to feel at least as bitter as those who are self indulgent (hence the Daily Mail) but that is because they resent serving. They do what they do for any number of reasons but not primarily out of a freely given love which neither asks for nor desires anything in return. What has this to do with meditation? Wisdom whom you encounter is a servant, her service is love. To understand her you too must be a servant. In meditation you bring the whole of yourself, you cannot pose as a loving servant for twenty minutes a day and learn the secrets of Wisdom as if she were fooled by your pose. The further you are from sin the closer you are to God because the more you resemble Him. And the more you resemble Him the more intimately you can be joined with Him. Another potent source of bitterness is death. Considered as a finality death robs us of those we love and brings to an end all our own hopes and dreams. It gives a futility to all that we do. All things must pass away so time spent doing anything other than eating, drinking and making merry is time wasted. Why sow for another to reap? Why build for another to tear down? Actually, death as such need not have such an impact. Even many people who have little or no belief in an afterlife do not find it a bitter thought that they will die. They invest their hopes for the future in their children or their community or their country or an ideal society which they devote their lives to creating. That is, they serve, out of love, and so rob death of its bitterness. It is only sin which gives death its sting. If self-gratification is everything then death is the end of everything and constitutes nothing but loss. In meditation it is no bad thing to remember that our time is limited and that we would do well to make the most of it. It is an introducing of bitterness into a conversation where it has no part if we seek Wisdom because we wish to avoid death. The chances are that if you have read my blog thus far then you already have a pretty good idea of what tediousness is. There goes ten minutes of your life that you'll never get back again. And that is the essence of it. Tediousness is a function of time. Any experience unduly prolonged becomes tedious. This applies to meditation considered as an exercise. It does not apply to our dialogue with Wisdom because this is a leaving behind of time and an entering into eternity where Wisdom dwells. In Part Two I referred, by way of a couple of hobbits, to 'living on the heights'. These are the heights which I had in mind. The period of time you set aside for meditation may be twenty or forty or sixty minutes or whatever. Some of that will be 'warming up' and some will be 'warming down', perhaps all of it will be, but at some point the grace of God may reach out and draw you into a dialogue with Himself. That may be for only a moment or maybe for much longer but time ceases to be relevant during that experience because you have left it behind, you have no consciousness of it and little awareness of much else either. There is no tediousness in eternity. There is a common experience in Christian meditation called the "Dark Night of the Soul." Tediousness is the common lot of our species but the meditator can divide her experience of it into "before the divine encounter" and "after the divine encounter" phases. That before needs little describing, we all know what it is. That after is indescribably dreary and dark and dry. It feels like a desert without end. There can be days, or weeks or years when we enter into our heart-home and repose ourselves and wait for our hidden guest, Wisdom, to appear and she chooses to make absence her mode of being with us. It would seem that our last state is worse than our first. But it is not so. Our encounters have taught us to know Him better and to love Him more, we are assured of His love for us, we have solid memories of all that we have experienced with Him. Deprivation of the light touch of His presence in the form of Wisdom is a period in which we realise that all that we desire is Him and comes from Him alone. Our encounters were not the result of our skill in the techniques of meditation or a reward for our virtues. They were pure gift, wholly unearned by us. The Dark Night is the season where our root of bitterness is burnt out tediously to prepare us for that which Wisdom will give us in her own time, and that unreservedly. In the meantime all we can do is wait and all we have to sustain us are faith, hope and love. In Part Four I hope to look at joy and gladness.